2 stars: Whimsical and indulgent; yet I couldn't get past the message. Vianne Rocher grew up a vagabond, constantly on the move with her mother, who was running from her own demons. Now that her mother's gone, she makes a life for her and her daughter through chocolate. Though they also tend to go where the wind blows, they tend to stay in each place a little longer, giving them more stability than she had growing up. One day the wind blows them into the tiny French town of Lansquenet. Anouk (her daughter) really wants to stay. They find an empty storefront for rent and get to work. Soon they have a gleaming shop full of delicious chocolate of all kinds. Vianne has a gift for making confections, and for knowing exactly the type that each customer likes the best. She also seems to have a gift for helping folks with their troubles. It is not all smooth sailing, however. The local Catholic priest, Pere Reynaud, takes her warmth, her liberality, and her chocolate as a personal affront. As his parishioners begin to fall sway to her charms, he becomes more and more outspoken in his condemnation. Then a group of gypsies moor their boats near town. Vianne, as you might guess, treats them with compassion, even though Father Reynaud preaches against them at every turn. She even comes over for dinner down at the riverside, and Anouk runs wild with their children. An act of arson eventually drives most of them away, but not before battle lines have been drawn even more clearly in the town. Written in alternating chapters, some from Vianne's viewpoint and some from Father Reynaud's. There was a lot I liked about his book. The author plays with color in a way that was fascinating and fun to read. When Vianne first comes to this repressed little town, everyone and everything is drab and gray and worn-down. She and Anouk both wear and embody color. Little by little, their friendliness, delicious chocolate, and magic touch bring life and hope back into the townspeople....who then add color to their own lives. Bad situations get better, relationships are made or mended; it's like a corset has been loosed and everyone begins to breathe again. 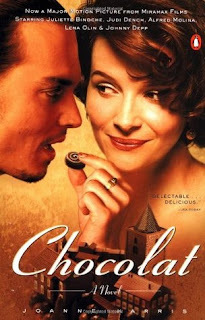 The chocolate itself was described in a way that was simply mouth-watering. I dare you to read it without indulging in some yourself! My favorite character was Armande--a feisty old woman who sees more than most, yet who remains vulnerable in some ways. She's a perfect foil for Vianne and adds sparkle to the story. Okay. A couple of things really bothered me. First--nearly all the characters come across as one-dimensional. Vianne is everything good. She is the breath of fresh air this town needs. The priest is evil and darkness. The gypsies--though they are painted as thieves and worse by the priest--are all hard-working, fun-loving, and honest (at least the ones we get to see in the story.) All of them. A few of the townspeople have slightly more depth, but not by much. Then, tying into that, the story itself strikes me as very anti-Christian. Vianne represents the very liberal, atheist view, and of course the priest is Catholic. They are enemies. The book makes no bones about that. They both acknowledge it to themselves. As I have mentioned, when Vianne first comes along, the townspeople are under the thumb of the priest (and therefore, the rules of the church). Let's talk about Father Reynaud a bit more. He is angry, rigid, a hypocrite, severe, dark, and unhealthy. Definitely a "my way or the highway" type. The people of his flock mirror many of those same traits: repressed, angry, back-biting, narrow-minded rule followers. Vianne's shop opens on the first day of Lent, and the priest is enraged when so many of his church members stop by for chocolate in defiance of the Lenten season. Vianne's believes that "being happy is the only important thing" (172). She is warm, friendly, open-minded, calm, and believes that every belief system has some beauty in it. Sounds good, right? Her whole plot line seems to be cheerfully breaking church rules, whether that means helping a friend leave her abusive husband (not that I disagree with that one, though the priest is beside himself), assisting another friend into a fatal diabetic coma, or having a one-night stand with one of the gypsies. As long as it makes someone happy (including herself), it's okay. Despite these and other morally questionable decisions, she is depicted as the savior of this town. Meanwhile the priests's job in the story is to make everyone as unhappy as possible while trying desperately to get them all to toe the line. It's only when he falls to his own inner temptations that the town is truly released and liberated; then everyone celebrates the chocolate festival instead of Easter. Um...hooray, I guess? Vianne says more than once to the priest something along the lines of "Isn't there room for us all?" which on the surface would seem to be theme of the book. However, the characterizations and plot answers that question with a definite "NO." If it were just Vianne and the priest that were drawn so starkly opposite, it would have come across as more of a portrayal of one town, or a showdown between these two personalities, rather than an indictment of religion. But all the characters were either for or against Vianne. I can't think of one neutral (main) character in the whole book. If they followed the priest, they were awful. If they followed Vianne, they were sympathetic. That doesn't seem to me like it's leaving room for everyone. Perhaps this depicts the author's own experience with Christianity? I don't know. I would have enjoyed it much more had the characters been more well-rounded. My own experience with religion has been that following Jesus Christ brings warmth, life, freedom, and lasting happiness. The very hope, kindness, and compassion that Vianne embodies, in fact. I've seen it in my life and in the lives of my family members. Content note: There are a handful of cuss words, and one non-graphic love scene close to the end. Have you read this one? What was your take on it? Talk to me!